Dulce de leche. The words sound so rich, so dreamy. Just reading them makes my mouth water. This delicious, creamy sauce is made by slowly heating and caramelizing sweetened milk and sugar. Traditionally the process is very slow and includes a lot of stirring, requiring you to stand at the saucepan while the mixture caramelizes. Some people make it by boiling a can of sweetened condensed milk in a pot of water. I’ve always hesitated to do this, however, knowing the potential dangers of an exploding can. Recently my friend Jen shared an easier method with me for creating dulce de leche using sweetened condensed milk. Her process couldn’t be simpler, and it produces a wonderfully thick and creamy sauce. I just had to share it with you! Use dulce de leche as a topping for ice cream, on pancakes or crepes, to flavor cakes and pies, or as an alternative to bottled caramel sauce. It’s the key ingredient in one of my upcoming Purim recipes (posting soon!). Or, just eat it with a spoon. It’s that good. 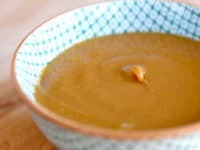 How to make Dulce de Leche lightly salted caramel sauce in the oven, easy recipe. 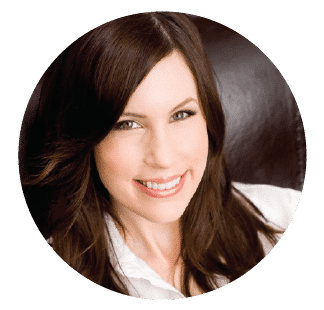 Kosher, Vegetarian, Dairy, Tutorial. 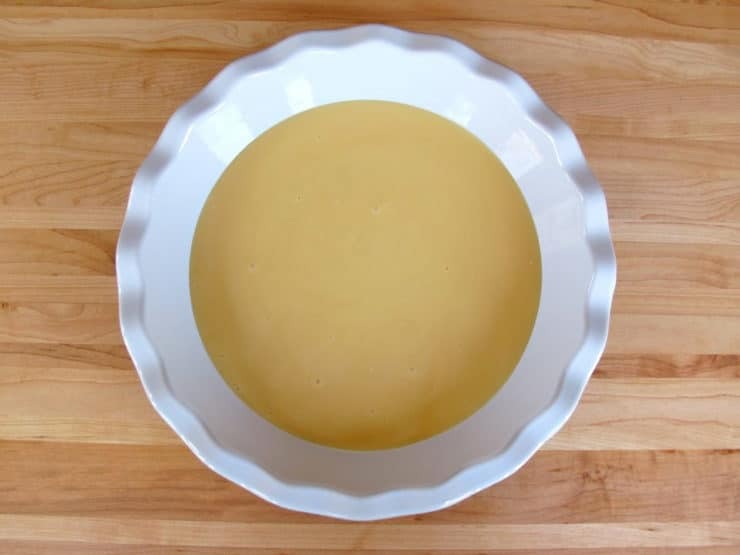 Preheat oven to 425 degrees F. Pour can of sweetened condensed milk into a ceramic pie plate or dish. 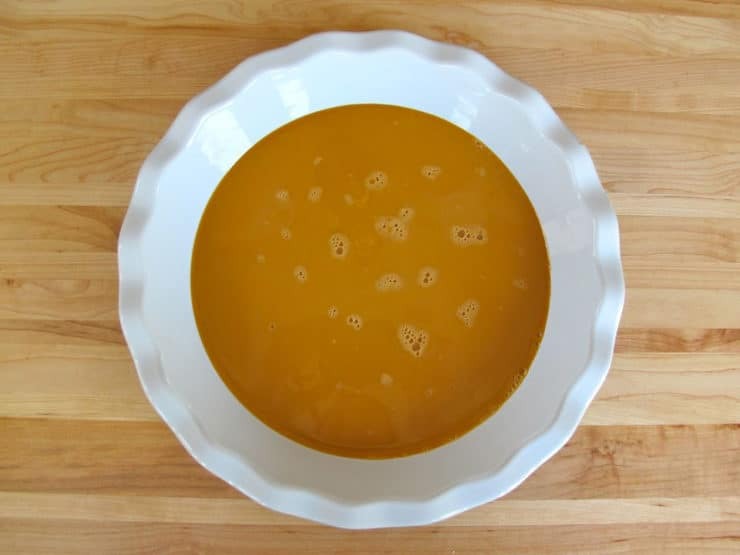 Sprinkle the milk lightly with about 1/8 tsp of salt (for a more salted caramel flavor, use 1/4 tsp salt). 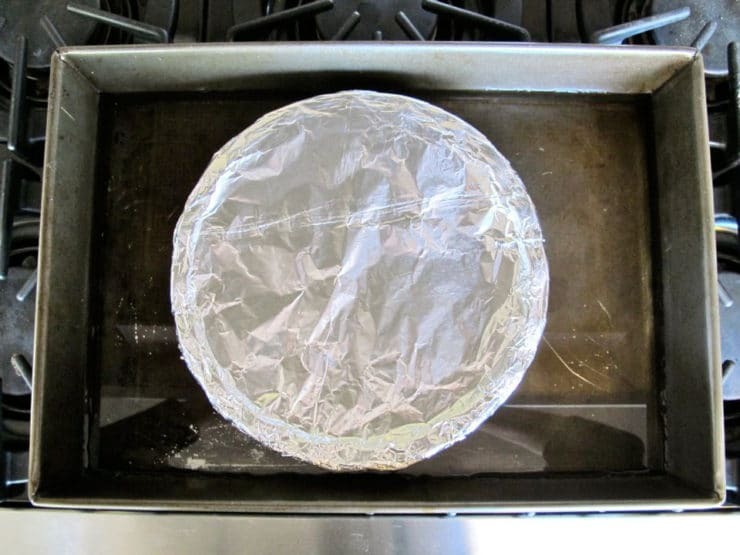 Cover tightly with foil. Place the filled pie plate into a large roasting pan and fill the roasting pan with water till it reaches about halfway up the sides of the pie plate. Place the roasting pan into the oven. Let the mixture cook slowly for 75-90 minutes, check the water level every half hour to make sure it hasn't dried out too much. Add water as needed. At 75 minutes, begin checking the color of the dulce de leche. When it reaches a rich light brown caramel color, you'll know it's ready. The longer you let it cook, the thicker and darker it will become. Take the pie plate and roasting pan out of the oven. Carefully remove the pie plate from the hot roasting pan. Take off the foil. 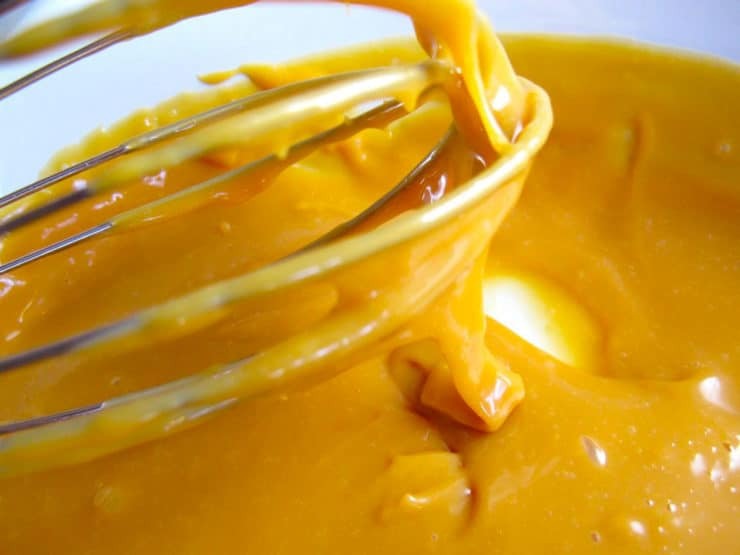 Whisk the dulce de leche mixture. 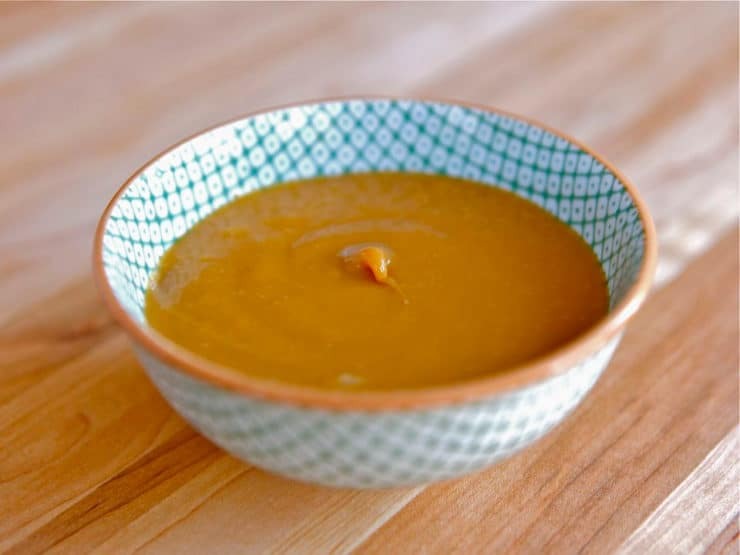 Use warm, or allow to cool to room temperature depending on your intended use. Store in the refrigerator. 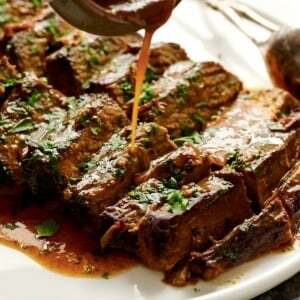 The sauce will keep for up to 4 weeks when refrigerated. Making this along with the Caramel Apple hamantaschen filling is one of the things I look forward to most at Purim. I’ve made your recipe perfectly three or four times in the past, but I had a problem making the dulce de leche today. The sweetened condensed milk totally separated and left a nice caramel-looking substance on the bottom and a thin, white milky liquid on top. So weird! I’m going to try and salvage the bottom portion and see what it tastes like. If not, I guess I will try again tomorrow! That’s very strange Suzanne! It’s never happened to me before. Not sure what to tell you! Hope the next batch turns out well. Is it vital the 1/8 tsp. salt is added to milk to make the Dulce de Leche if a “salted” caramel flavor is not wanted at all? I had a very bad experience with a salted caramel item a while back and now I don’t care for the flavor at all. Is this salt necessary to make this into the Leche? I’ve never made any before at home. Not necessary if you don’t enjoy the salt note in the flavor. Hi, Tori’s assistant Ashley here! It is possible to make dairy free dulce de leche with coconut milk, though we have not currently developed a recipe. I would not suggest substituting the condensed milk with coconut milk in this recipe since I am unsure of the amount of sugar you would need to add. the tradition in mexico started as a way to conserve any overabundance of goat milk produced by the tejidos communally or by family. that which was not turned into cheese went into thick pots to which was added piloncillo, (un-refined dark cane sugar). in the papantla region where the most and the best vanilla is grown, the people would add vanilla. lots of it. the mixture was slowly reduced over low fires until very thick. until recent decades, cajeta, the major brand of commercial dulce de leche did not discriminate on its’ jars whether it was dulce de leche de cabra, (goat) or dulce de leche de vaca, (cow) becuz it was all goat milk. the cajeta trade mark may still be an alpine goat head face shot. since there is not much canning going on among the tejidos and not a lot of available refrigeration, the indigenous folk there have countless jokes about gringos boiling cans to make dulces. Hi Tory. Loved the ease of this method but my results were only so so. Probably due to fluctuations in my oven. The milk did not deepen in color or flavor, but did curdle. Finished it off on the stove top adding water to keep it going. Can’t wait to start the caramel apple filling. Thanks for your blog. It’s my first stop when looking for a recipe or cookin advice! I have loved all things salted caramel since i tried it in Normandy France about 7 years ago. This is my first attempt at any type and its cooking in the oven right now!!!! Thanks for the recipes, I’m going crazy saving them!! Why add salt to the condensed milk? I made 4 cans in the crockpot added water to cover & cooked on low, after I let them cool, opened a can & never thought of adding salt, it’s delicious! I wonder what went wrong for you. Dulce de leche is caramelized sweetened milk and sugar. Traditionally it is made by stirring sweetened condensed milk slowly for a long time over low heat, or boiling a can of sweetened condensed milk. This is simply a different, faster, safer heating method for making the exact same thing– chemistry-wise, it is no different than any other dulce de leche. Are you sure you used sweetened condensed milk, and not simply condensed milk? Perhaps you didn’t cook it long enough, or you cooked it too long? Other readers have had great success with this method. I’m sorry your experience wasn’t the same. Can I use glass dishes in the oven? I don’t have a ceramic pie plate and can’t find my roasting pan… Who knows where it went??? Lol Just wondering if there’s a reason I should use ceramic or metal pans. Thanks!! Yes, as long as it’s an oven-safe glass dish (like Pyrex for baking). Enjoy! FWIW, my 1st encounter with making Dulce de Leche was when I tutored a visiting Venezuelan university student in English 40 years ago. We became good friends and she began to show me her favorite dishes from her home. The first was Dulce de Leche which then could not be bought in the US. She did exactly what is supposed to be so risky and either simmered the can in a pot of water on the hob for about 2 hours or in the oven in an ovenproof pan of water [kept it about 1/2 way up the side of the can. She assured me that everyone made it these ways in Venezuela, so I think that it must be extremely rare or the can to explode. You say ” I think that it must be extremely rare for the can to explode” As far as I am concerned if it only has happen one time to someone it it still one time too many just the sheer potential of an exploding can should steer anyone away of doing it in this manner. For myself I am happy to have found this site which gives you a very easy safe way of making Dulce de Leche. My safe method is to open 2 cans of condensed milk & pour into a canning jar. I seal it tight, cover with water & cook on low in my crockpot. Sounds great! Is it ok to use a glass Pyrex pan or any other alternative ? Thank you! Hi S! Yes, a glass Pyrex will work fine as long as you’re not broiling. It’s not recommended to use glass in broiling situations because of the shattering risk. But for this application, it will work just fine. Enjoy! It’s so nice to have a delicious alternative to the treacherous “boil in the can” method. Here’s a challenge: Is it possible to make a pareve dulce de leche? Without the leche? Or would it involve too many artificial ingredients? Thank you for the beautifully written recipes and food history. I eagerly look forward to reading all your posts. Jack, in Colombia is called Manjar blanco or Arequipe and like in your country is very traditional in mine too. Can you clarify again the “cook slowly” part. You preheat the oven to 425, but then do you leave it at that temp? Or, do you turn it down or off once put in the oven? Thanks. Let it cook in the oven at 425 degrees F. undisturbed for at least 70 minutes before you begin checking for color/texture. in Chile, this is called manjar (man-char) “ch” is the “back of the throat” sound, also very kosher!! 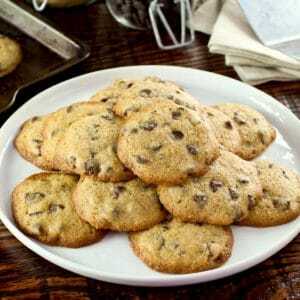 We already made a few of your recipes and they were ALL `delish`! 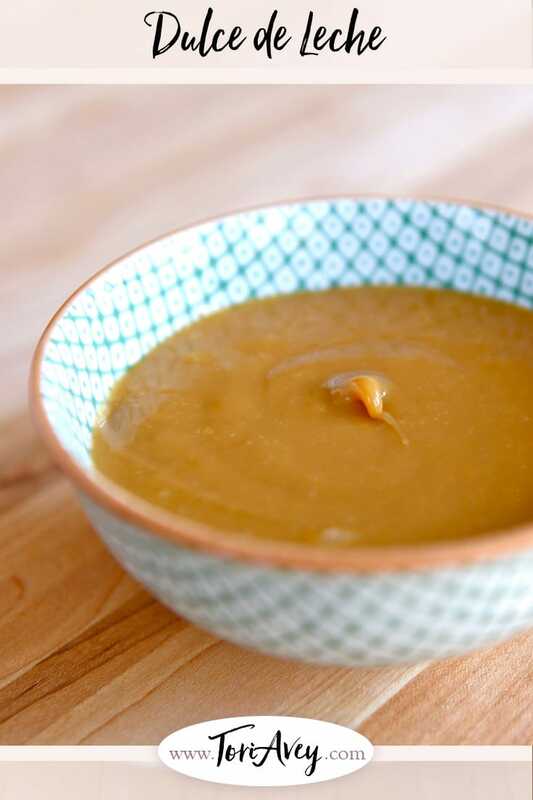 Do you know how to make a parve/dairy free version of de dulce de leche? Could a condensed form of soy milk or Almond milk be used? If so, how can we make a parve condensed ~milk~? Thank you, Purim sameach! Hi Sarah Malka, I’m just wondering if you tried making a condensed soy or almond milk for this recipe. And if so, how did it turn out? Thank-you! I know someone who was badly injured by an exploding can while making it that way. She had done it many times before with no mishaps. I’m looking forward to trying your method! Thanks for posting your comment. Sorry to hear that any one was hurt. I posted the comment from Eagle Brand on the other web site and a blogger got mad because I shared my views and she, “The Nurse”, was sure it was OK to boil the can because she never had a problem. I told her she was not the only nurse on that site! Never throw caution to the wind when common sense should rule the day. I love this stuff on pretty much anything! I haven’t made my own yet, but know I’ll love it! I found a boil the can recipe on another web site. Thinking it was dangerous or leaching toxins from the can, I emailed Eagle Brand and asked their opinion about boiling their can. They gave no details but didn’t recommend doing that and pointed to a recipe, using a different technique, on their web site instead. Accidents happen and they aren’t selective. I always cook caramel in the pressure cooker. Place 4 cans of condensed milk on top of a doubled folded dishtowel inside the pressure cooker. Don’t let them touch the sides or each other. Fill with water to an inch over the tins. Bring up to full pressure, and cook for 40 mins. Let cool before opening, as hot caramel could burn you as it shoots out the can if you open while hot. hahaha. perhaps next time I’ll read the entire post before commenting….seriously, I boil the can ALL the time and nothing horrid has happened. Someone even told me it can be done in a pressure cooker in under a half-hour! My very good friend who was weaned on dulce de leche in Argentina had the unfortunate experience of forgetting that she had a can of condensed milk on the stove and leaving the house. She returned to find the contents of the can coating the ceiling.